The public library development in India remains an untouched affair. Most of the public libraries in India are either under-utilised or lack adequate resources to cater to the demand of its users. Considering that the public libraries are easy to access knowledge centres, it demands urgent attention for reinvention and transformation. 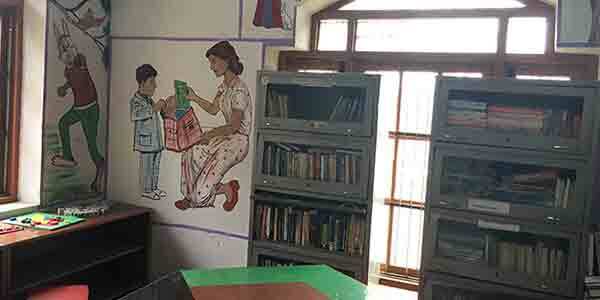 Considering the violence that the state of J&K has been witnessing, the public libraries act as spaces where children and adolescents are able to engage themselves positively amidst civil disorder which otherwise leaves lasting traumatic impressions on their tender mind. AMAN Trust in collaboration with NASSCOM Foundation launched project IPLM in J&K with a vision to support and train library administration staffs to enhance and develop their skills that is needed in process of repositioning public libraries. AMAN’s field team engaged rigorously in mobilising the community across 12 districts in the state J&K public libraries to generate awareness and promote the use of public libraries. New services such as – introduction of NEET JEE preparatory material, e-learning resources, ICT readiness related devices, construction of children’s corner were added to these libraries for enhancing library user’s experience. The project understands the importance of networking and developing sustainable partnership to harness resources from the community for effective functioning of libraries. Several rounds of training for the librarians and other staffs were conducted by the capacity building expert team. Most of the librarians admitted that project IPLM J&K has resulted in increased number of users of library services especially the youth population. It has also led to rewarding collaboration between AMAN Trust and the state department of library and research, J&K.